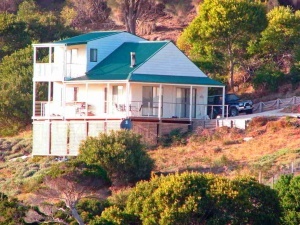 Palana Retreat is Flinders Island’s northernmost luxury accommodation. Your modern two storey, two bedroom, two bathroom accommodation overlooks Blyth Bay, Pratts River, Inner Sister and Outer Sister Islands. The house is totally timber lined and has timber flooring. Cathedral ceilings dominate the downstairs living area. Enjoy a spa, an open fire and luxury amenities. Just relax, be spoilt and take in the beauty of the north of bold, beautiful Flinders Island. A two minute walk finds you on Palana Beach. North East River and Killiecrankie are recommended visitor spots while you are at this end of the island and are only a short drive away. The two bedrooms comprise the master bedroom upstairs with queen sized bed and its own private balcony and café setting. It also has its own shower and toilet. Downstairs the second bedroom can accommodate two single beds or a king sized bed. A cot, high chair and car seat are also available for your use. Facilities include airconditioning, open fire, spa, dishwasher, microwave, fridge/freezer, gas oven and hotplates with rangehood, BBQ, Satellite TV complete with DVD/Video player and entertainment system. A washing machine and dryer are also provided. There is also a 4WD Daihatsu Feroza available for use on a per kilometer charge basis. There is no daily hire charge. Free transfers to and from Whitemark airport are available for bookings of more than 2 nights. A car is also available for your use if required at a minimal usage rate. Book for 7 days and receive a 10% discount off your accommodation bill. Visit our website for further details. Click on the website link above. Modern two storey Second bedroom can be set as a king sized bed or two singles. Accommodation is for a maximum of 4 people. Prices quoted are for 1-2 people. Additional people are $30 per person per night, payable on arrival.